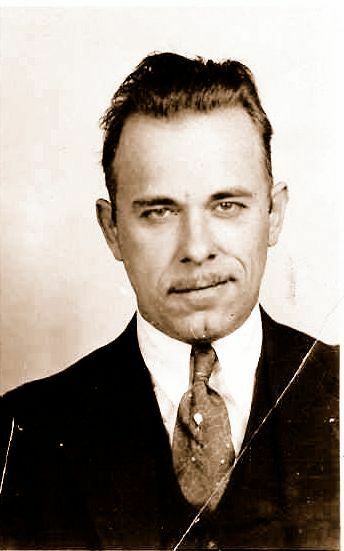 Thank Goodness for John Dillinger…. In case you’re wondering why anyone would be thankful for the life of a notorious gangster and murderer, if it wasn’t for the link between John Dillinger and an old hotel in downtown Tucson, I wouldn’t have very much of interest to tell you about our visit to that city. Read on and see for yourself……..
As I noted in a previous blog-post, we were excited to be moving on from the Phoenix area, and to start exploring other cities and attractions to the south – in particular Tucson. Now doesn’t that sound pretty interesting? It did to us, and we headed downtown (from the Arizona Inn) toward Congress Street with much anticipation. Along the way we spotted one of the most interesting overpasses I have ever seen, intentionally designed to resemble a rattlesnake, a creature that is quite prevalent throughout the southwest United States. 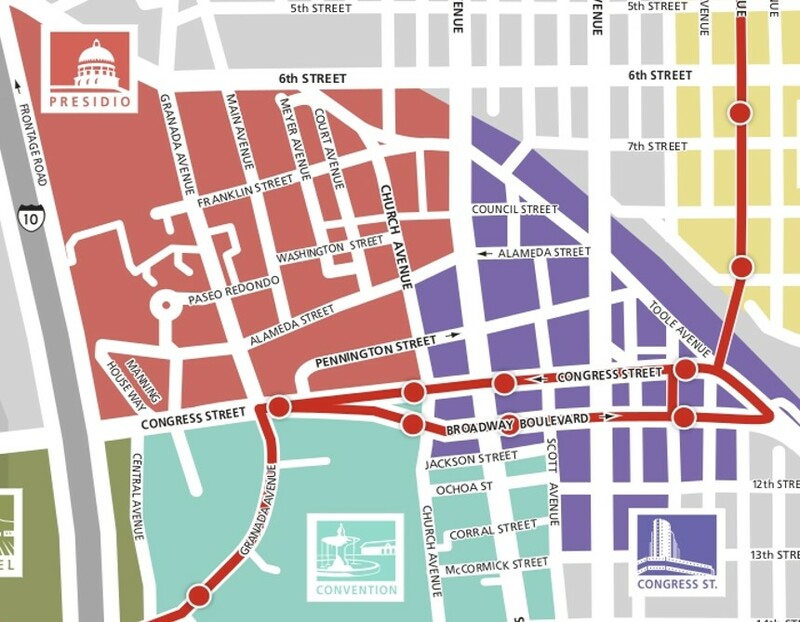 Moving on, we had no difficulty finding Congress Street as the downtown core of Tucson is quite small. As we got out of the car, our first impression was one of “this is a pretty clean downtown core, but there aren’t many people around for a weekday”. As it happened, we had parked less than a 100 yards from the historic Hotel Congress, so we made our way over to it, and ventured inside. It is like taking a step back in time, although the lobby looks like a cross between a 1930’s movie and a funky south-west art gallery. As we sidled along the main floor of the hotel, we saw a classic sit-down, close-the door, wooden-phone booth. Beside it was the original switchboard with roughly 30 octopus-like lines plugged into the various different room portals. Then, as we moved further into the dark, woody lobby, we encountered the front desk – looking exactly like I’d expect a front desk to look if the year was 1919, and I had been transported back in time. The only thing out-of-place from that throwback image was the girl behind the front desk. She had multi-coloured hair, multiple face piercings, and a sleeve of tats that would make David Beckham jealous. No worries though as she was extremely pleasant and was more than willing to tell me about the history of the hotel – which is most famous for being the site where the notorious gangster John Dillinger and his gang were holed up during the winter of 1934,as they tried to avoid the Midwest authorities. On January 22nd, 1934, a fire started in the basement of the hotel, and spread up an elevator shaft to the third floor, where the notorious bank robbers were booked in under aliases. The gang members were extradited back east, to Ohio, to be tried for the shooting death of a local sheriff. Eventually found guilty of numerous crimes, one of them was gunned down during a prison escape attempt. A second was executed via electric chair, and a third remained behind bars until August, 1968, where he was released under medical parole, and passed away shortly after. As for Dillinger himself, on January 30th, 1934, he was flown to Chicago, and transported to a jail in Indiana. Five weeks later he made a daring escape using a hand-carved wooden gun. He remained on the loose until that July, when he was shot and killed by lawmen and federal officers as he left the Biograph theatre in Chicago. To commemorate the events of that January night in 1934, and the role that the Hotel Congress played in them, every January, the city of Tucson puts on an “Dillinger Days” festival. It includes re-enactments of his capture, an on-site fire re-enactment and various other vintage-themed activities. Sounds like fun! Once we were seated inside, the waitress brought us our Dillinger-themed menus, and we had a fantastic and inexpensive breakfast while we discussed and planned our downtown walk, which was to follow. One of the more interesting and innovative design features of the “Cup Café” were the wine bottle chandeliers. I think Mary and I are partial to, and take notice of recycled and re-purposed art, since that is very much Kathryn’s focus (our oldest daughter), as a mixed media artist, illustrator and designer. With breakfast out of the way, we set out to wander the streets of downtown Tucson, and I can sum up the next three hours of the day in one word – “Underwhelming”. We criss-crossed the downtown streets looking for the colourful barrios and historic sites, sidewalk cafes, vintage shops, and art galleries that Where Magazine had promised. We had no difficulty finding the Rialto Theatre since it was right across the street from the Hotel Congress, and it qualifies as a historic building since it was also built in 1919 in conjunction with the Hotel Congress. Speaking of historic, we noticed on a window poster that one of the next acts to play at the Rialto was Tom Jones. We both commented that it was a long way from headlining in Las Vegas to performing at a very small theatre in Tucson. A bit further along on Congress Street, we found the Fox Theatre, a building that has fallen into disrepair over the past 30 years, but is slowly being restored to its former glory with the help of ongoing fund-raising activities, and benefit concerts. But there simply weren’t that many interesting shops or boutique galleries. I don’t know if it was the heat, or the disappointment of not finding much to look at, but we had one of the very few grumpy moments of our entire trip that day. I was pissed off at Where Magazine for over-promising, and Mary was pissed off at the downtown core of Tucson, for under-delivering. Toward the end of our “walk”, we came upon the Pima County Courthouse. Built in 1928, and featuring a blend of Mission Revival and Spanish Colonial-style architecture, it has served as a courthouse since it’s opening, and it also houses the offices of various local public officials. Behind it, is the Plaza de las Armas, a courtyard where traditional fiestas, circuses, concerts and other public events have been held since the 18th century. It was a lovely spot in the middle of a number of government-related buildings in the downtown core for relaxing, eating lunch (perhaps purchased from one of the many vendors set up in the plaza), sunning, and people-watching. Given our grumpiness of the moment, I don’t think we fully appreciated how nice it was, and we simply continued on in our pursuit of interesting sites, shops, and local history. As we walked around Tucson that day, we noticed what was obviously a new “street-car” system that was being tested, with driver training in full swing. The tracks are in place and most of the road disruptions are out of the way. The launch is planned for the “early summer” of 2014, and according to Sun Link, the city’s transit system, more than 100,000 people (20% of the population), live and/or work within a block of the new line. By mid-afternoon, we finally got to the “screw it” point, and headed back to our car. Hot, disappointed, dehydrated, and both feeling the onset of a headache, we turned on “Jane”, (the name we had given our GPS) and asked her to find us the nearest Starbucks, and to locate any Barnes & Noble stores in the area. A couple of tall skinny vanilla lattes and some trashy magazines were just we needed to improve our mood, and it worked! We are not alone in our disappointment of downtown Tucson as a tourist destination. I subsequently read a number of Trip Advisor reviews from people echoing similar sentiments to those that I’ve expressed in this blog-post. There is definitely the potential for Tucson to become something worth exploring, but for now it gets a “fail” from us.